Solar-Powered Cars Coming to St. Croix? Moving away from fossil fuels is all the rage and if one entrepreneur has his way, cruise ship passengers may soon be zipping from the Frederiksted pier to St. Croix’s beaches, restaurants and wooded hills in rented, solar-powered electric runabouts. Speaking to the V.I. Energy Office and the V.I. Small Business Development Center Friday, Nelson Edwards describe how he sold a thriving optometry practice outside of his hometown of Detroit to come to St. Croix and see if there is a niche for these emissions-free runabouts. He and several partners have established a local company called SunBug and are looking for a location in Frederiksted to set up shop. Once that is done and all the regulatory hurdles are dealt with, he hopes to bring in the first batch of vehicles. These particular vehicles are considered a low-speed hybrid electric vehicle, because they have a maximum speed of about 22 miles per hour and its batteries are charged by a solar panel on the roof or by plugging into an outlet. They are more like a more robust, souped-up golf cart than a full-sized car. The idea came about during past trips to the territory, he said. Over the course of his years as an optometrist, he visited St. Croix, along with many other Caribbean islands, numerous times, doing dozens of free clinics through Rotary International. Visiting St. Croix with his wife, they liked the rental car they had, "but as a tourist we were aware of the negative environmental effects we were causing to this wonderful island," he said. "We were not travelling great distances, just into town to shop and to the beach, short trips; the perfect type of trip for a small neighborhood electric vehicle." The idea of using this sort of vehicle first struck him while visiting a friend in a large planned community in Florida called The Villages, where this sort of vehicle provides most of the resident transportation. Researching the vehicles’ track record and history, he found similar rental vehicles had been a mainstay in Key West, Fla. for over a decade. "Hundreds are rented daily," he said. These vehicles can go about 70 miles on a charge, Edwards said. If completely drained, it would take two or three days of sunshine or a day of charging from an outlet, to fully recharge, he said. But more typical use would be travelling 20 or 30 miles, so charge-up time would generally be much quicker, he said. In Key West, they rent for $80 to $120 a day, but he expects rates to be lower than that on St. Croix. There may be a regulatory hitch in getting his business up and running, Edwards said. When he brought the first one in to the Bureau of Motor Vehicles, he was told he could not register it. "Even though there is a law on the books saying they are legal, the bureau director (Jerris Browne) said he believes they are too dangerous," Edwards said. In Edwards view, the BMV is mistaken. Although in regular use for nearly 15 years in Key West, "according to the Key West Police Department, there has never been a traffic fatality involving an electric vehicle," he said. This sort of vehicle is not new to the territory, though the plan to power them with the sun and rent them may be. After several years of lobbying on St. Thomas by Doug White, the V.I. Legislature passed a law in 2005 allowing this sort of vehicle on roads where traffic goes less than 35 miles per hour. White, an architect, has a Chrysler GEM, a similar vehicle that plugs in to charge and does not have a solar panel. On St. Croix, Arlen Wheeler owns and sells GEMs. After finding a rental location in or near town, Edwards said SunBug would try to advertise to cruise ship passengers and rent the vehicles from a kiosk or vendor’s tent when ships were in. But residents, hotel guests and island visitors would be able to rent them all the time, he said. They would also be for sale, for between $12,000 and $15,000. Anyone thinking to purchase should know there is a V.I. Energy Office rebate of up to $5,000 for hybrid, electric and high efficiency vehicles. If or once the regulatory hurdles are overcome, they are ready to bring in the first batch of a dozen vehicles and set up shop immediately, Edwards said. Nice idea BUT at a top speed of only 22 mph, I get the feeling that they’ll be clogging up the roads. Not many people driving 20 on STX. I can just see a long of cars behind one of these. 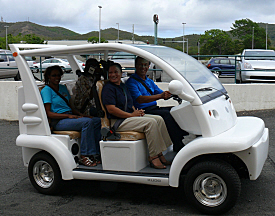 Like hefty golf carts – however STX is not one big golf course. create Green jobs/and pays taxes as a business and helps revitalize Frederiksted. The Greatest danger to these vehicles on St Croix are the over weiight, under inspected,speeding dump trucks that rule the roads from East to West. There are already Eco sized cars and motorcycles on St Croix that are the same size as these vehicles. This idea should be embraced and commended by the Virgin Island Government as a positive development for the Territory.